DUBLIN — More than a third of European PR agencies say clients’ unwillingness to commit sufficient funds to PR is now their key challenge, according to new research from the International Communications Consultancy Organisation (ICCO). 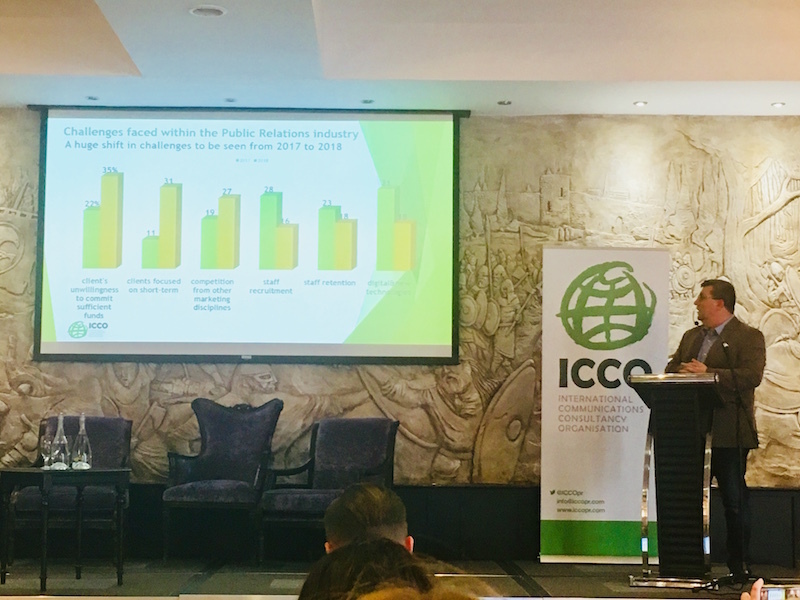 In a preview of the forthcoming annual ICCO World Report at the ICCO Global Summit in Dublin this week, regional president Juergen Gangoly, CEO of Austrian PR agency The Skills Group, said 35% of the organisation’s European members said “more comms for less budget” was their biggest concern, leaping up from 22% last year. Other challenges included competition from other marketing disciplines, up from 19% to 27%, and digital/new technologies, down from being seen as the biggest challenge last year (31%) to 18% last year. Recruitment was also seen as a slightly less concern this year, down from 28% to 16%, and only 18% of respondents said staff retention was their primary challenge, down from 32% in 2017. Overall, however, the survey found that 47% of agencies are “very optimistic” about the growth of the PR industry, and 41% are seeing an increase in profitability this year. Areas of future growth included digital communication – 69% said they expected this to be a growth area – as well as corporate reputation (41%), marketing communications (33%) and social responsibility (39%). Mirroring this, the skills identified as being most important for the future of the industry were an even split of crisis management, creativity, multimedia and content, measurement and analytics, insight and planning, and social media community management. Outside the scope of the ICCO World Report, another big challenge discussed at recent European meetings was the declining trust in media all over Europe, with the mainstream media in financial difficulties and the dominance of the so-called “boulevard” or tabloid media.